Incontra la guida esperta davanti al tuo hotel nel centro di Sorrento, o presso altri punti di prelievo prestabiliti; sali a bordo di un pullman con aria condizionata, per poi rilassarti durante il viaggio verso la cima del monte... e indietro nel tempo. Viaggia lungo la strada costiera panoramica, passando accanto a splendide cittadine; quindi, dopo circa un'ora, inizia la salita fino al Vesuvio. Mentre il pullman si fa strada su per la montagna, la tua guida ti racconterà delle enormi eruzioni che hanno avuto luogo qui più di 2.000 anni fa. Le fiorenti antiche città romane di Pompei ed Ercolano furono entrambe inondate di cenere, che uccise circa 16.000 persone, seppellendo cittadine intere. Il pullman si inerpica a quasi 1.000 metri, dove avrai l'opportunità di goderti un'emozionante vista panoramica a 360 gradi che abbraccia la penisola sorrentina, la baia di Napoli, l'isola di Capri, e la città di Napoli sottostante. È anche possibile unirsi alla guida in una passeggiata fino al cratere vero e proprio, imparando a conoscere la geologia e la storia della zona lungo il tragitto. Cerca il cratere di questo vulcano dormiente, ma ancora attivo, e ammira la devastazione che riuscì a causare in passato. 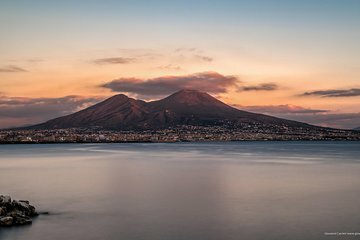 Dopo aver esplorato autonomamente la cima del monte Vesuvio, segui la guida per tornare al pullman che ti riporterà a Sorrento, dove potrai essere riaccompagnato al punto di prelievo. Lovely guide chatted most of the way on the journey to and up the volcano. Very informative and entertaining. Comfortable small bus took us most of the way up. Then we were dropped off to make our way up the rest of the climb. There was a little confusion over who had entrance tickets for climbing up the volcano, this was not the guides fault it is the system of booking which offers tickets to some but not all. However the excellent guide sorted everyone out and we were all able to go up to the crater mouth. Facilities on Vesuvius are basic to say the least, tardis toilets in that heat are not pleasant! Journey back to our hotel/drop off points was excellent with more local information from our guide. The tour was great! We had a knowledgeable and funny tour guide. The hike was tough to the top of the volcano but it was worth it when we got th there. This tour was definitely worth it! I highly recommend this tour! Convenient pick up points. Our guide Clementina was friendly and gave us information about what we were passing the whole way there. Our only thing was that we stopped at a random jewellery showroom where we were told there would be refreshments bit there were none. Excellent experience. A bit chilly and winding making our way up but very enjoyable. Highly recommend all to take wind breakers/jackets. Awesome views from the top!!! We got there but that is really all I can say. Unfortunately our guides English was not great but she managed to get all the information across fine all the same. I felt we were not given enough time on this trip as unfortunately traffic was pretty heavy getting to Vesuvius and took an hour longer than expected. The guide and driver were aware of the traffic problems around this area at this time of year September but no alterations were made. We were given 75 minutes to get from the parking area to the summit, look around and get back again. It takes around 25 to 30 minutes to walk to the summit depending on how fit you are some of our group took 35 minutes. This does not give you much time to look around or go that little further and gives you no time at all for a guided tour at the top which would have been very interesting.